It's fair to say that 85% of SCam's menus and functions more or less duplicate those of the built-in Camera application. 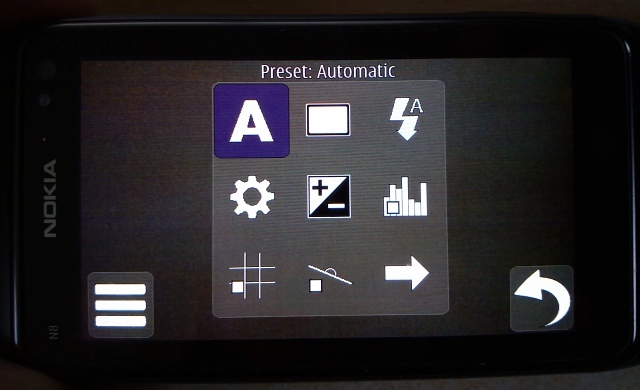 But then that's what we said about Camera Pro, and that ended up having a few neat uses. The 'histogram' feature leapt out at me, essentially the same data that's part of the upcoming UI in the 808 PureView, which means that it's something that most keen Nokia camera phone fans should be taking note of. Essentially, a histogram in this context is a chart showing how dark or light the pixels in your current on-screen image are. The more pixels there are which aren't detecting much light, the more they register at the lower end of the histogram - the more pixels that are inundated with light, the more they register at the top end. Ideally, a well exposed photograph will have a good spread of pixel counts across the dark-light range, with very little at the very highest (100%) register. Where the histogram can be useful is in spotting that the pixels are skewed to one extreme or another and adjusting framing or exposure compensation (in the menu) to fix this. Of course, if you're shooting a moody sunset then you may well be fine with a dark skew - the ultimate arbiter of whether a photo's any good is your own pair of eyes. Similarly, if you notice that there's a sharp peak right at the top end, it means that exposure is probably too high - though again, a lot is down to your own skill and judgement - shooting a snow scene in sunlight is likely to produce a light-skewed histogram yet your eyes will tell you that it'll be fine. At least you now know what the 808's histogram is going to show, anyway! Also shown in the photo above is SCam's 'horizon line', which comes in surprisingly useful. 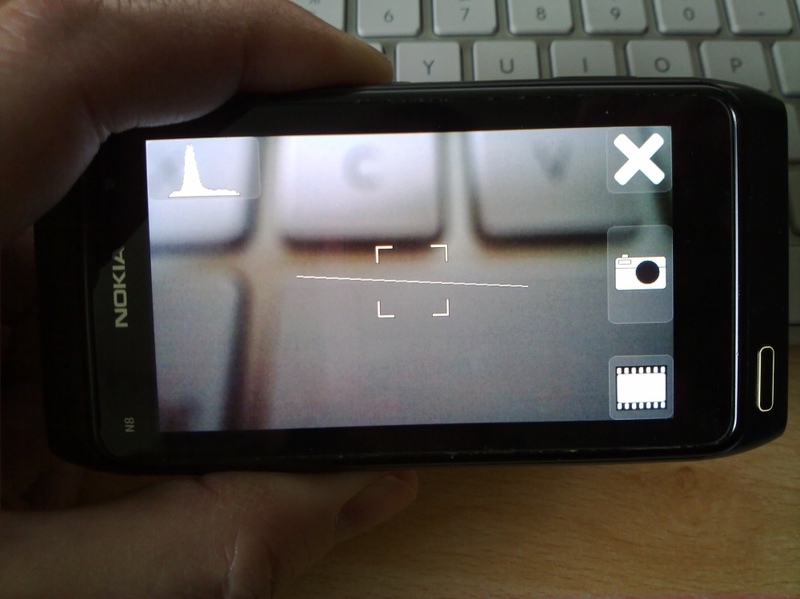 I'm sure you recognise the scenario: you're shooting a scene and find out later that you weren't holding the N8 (or whatever) completely level, and then have to rotate the photo by a degree or so in Photoshop on the desktop, losing a little bit of quality in the process. Slightly oddly, there are two panels of options - I'd have thought the contents of both panels could easily have been put onto one, spanning the screen. A lot of the icons are self explanatory and largely behave as per the built in Camera functions, but a few are worthy of special mention. 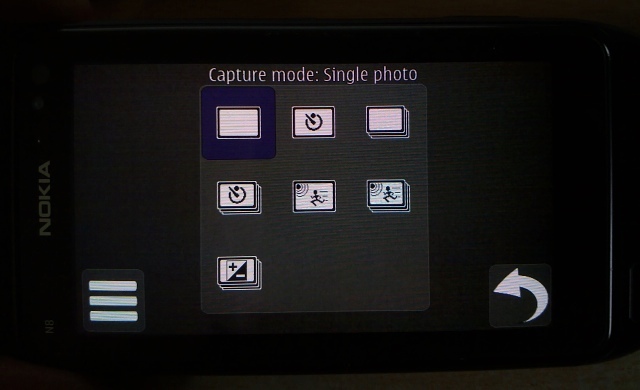 The 'Capture mode' introduces extra modes which aren't part of the built-in app: 'Continuous' works quite well, snapping every second or so, though this isn't really fast enough to snap a spread of photos of, say, a child running a race on sports day - you wouldn't get many samples. 'Time lapse' looks interesting, but seems set at 30 seconds - a degree of customisation would have helped. The 'View' icon on the main screen just pops up the last photo taken, for easy emailing off or deletion, but it's worth mentioning in passing because it offers the chance to display the histogram for that image, i.e. retrospectively. Which may be useful to some? Overall, I didn't find SCam very inspiring, it's true, I'm firmly in the 'leave everything on default most of the time and trust my own eyes, skill and knowledge of lighting' camp, but at the same time, for the sake of £1, I find it easy enough to recommend that N8 owners, at least, add this to their ever-growing folder of camera applications.